We propose NoboCall, an automatic, crowd sourced illegal robocall blocking system. NoboCall integrates three key ideas: realtime blacklisting, crowd sourcing, and audio analysis. NoboCall's server maintains a realtime blacklist of phone numbers and audio features of robocalls reported by callees. 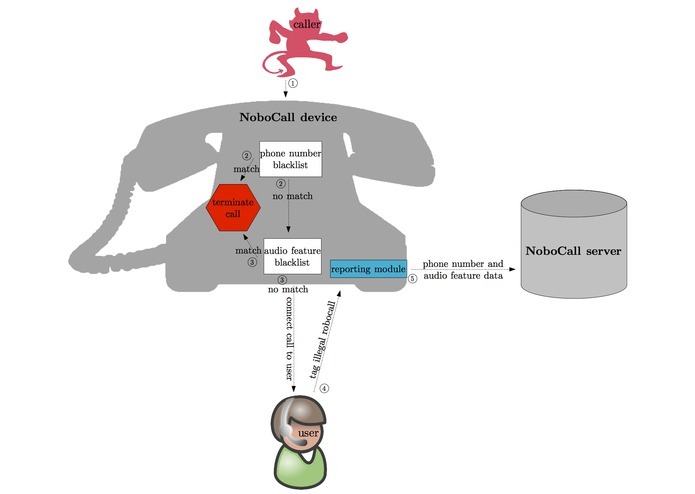 NoboCall builds the blacklist from scratch by crowd sourcing: when a callee receives an illegal robocall, she uses her NoboCall client, such as an app on her smartphone, to report the number and audio feature of the call. When a call comes in, the NoboCall client checks the number and audio feature of the call against the blacklist and blocks the call if it finds a match. NoboCall can block illegal robocalls effectively even if the robocallers spoof their numbers. It can protect all phones: mobile phones, wired lines, and VoIP landlines. We have developed a prototype of our server and an app for smartphones. We show that it is difficult for robocallers to circumvent NoboCall. It is easy, efficient, satisfying, and fail-safe for consumers to use NoboCall, even for people with disabilities. NoboCall requires no change to existing infrastructure. It requires only a server and one client per each phone (e.g., an app for smartphone). It can be deployed immediately, incrementally, and cheaply.